Janna’s is proud to be sharing the art of Belly Dance for over 25 years in the Tidewater area. Our studio provides a safe and clean environment to explore your creative side though dance. Each class is designed to bring out the best in you and encourage your love of creative movement. Our trained professional instructors will take you from how to stand correctly to release your body into the flow of each movement and combo to how to put each step together to form performance ready dances. Dance is fun and clears the mind and soul. Give Belly Dance a chance to bring out the dancer in you! bellybee@earthlink.net–or just click on the contact button above! 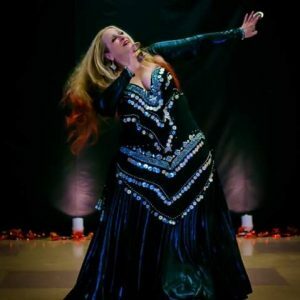 Janna Beaufait has been teaching Belly Dance since 1989 and has trained hundreds of ladies and gentlemen how to take the dance floor with confidence. Give her a call at the above number to see how dance can change your life!